Published by Nobex Technologies Inc. 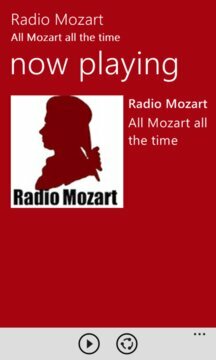 The concept of Radio Mozart is original, unique and very simple: Mozart and nothing but Mozart. 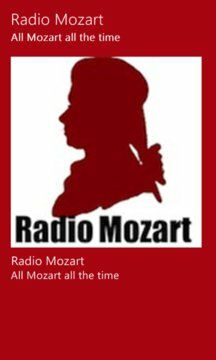 All of Mozart's works are available in our carefully dosed program, which combines all genres (symphonies, concertos, serenades, religious music, opera...). We propose the most famous compositions of the divine Mozart, such as Symphony No. 40, Eine kleine Nachtmusik and his most popular operas, but also many overlooked pieces to discover.